Demilec® Inc. is excited to announce their Heatlok® HFO High Lift and Heatlok HFO Pro are now radon gas resistant and can be used in place of a conventional polyurethane membrane barrier to mitigate risk of radon incursion. Most modern building regulations require all foundation seams and breaches to be sealed to prevent the incursion of radon, an invisible, odorless, radioactive gas and America’s second most common source of lung cancer. Heatlok HFO is sprayed on substrate before a basement floor is poured. A single pass can seal wall and floor seams, as well as the space around utility fittings such as floor drains, sewer lines, and electrical passages. Heatlok HFO is an ICC compliant air barrier, sealing gas as well as, or better than, industry standard products. According to Demilec, Heatlok HFO is also 11 times more efficient than the conventional polyurethane membrane used to seal against radon. In late 2018, that thermal efficiency earned Heatlok HFO the Center for the Polyurethane Industry’s (CPI) coveted Innovation Award. Heatlok HFO High Lift is rated at an R-value of 7.5/inch, while Heatlok HFO Pro, designed for commercial and industrial applications, has an R-value of 7.4/inch. Demilec also cites Heatlok HFO’s environmentally responsible composition as a benefit, as it is composed of 12.5% post-consumer waste. To date, Demilec has recycled more than 400 million plastic bottles to manufacture their spray foam products. Heatlok HFO generates no jobsite trash and is sprayed from reusable containers. “Spraying Heatlok HFO under slab in basement serves two distinct purposes in the building envelope. It provides thermal insulation in an area which can be the coldest part of the home, and it helps prevent carcinogenic radon gas from entering the living space. All done without having to tape down and seal polyethylene sheeting,” says Douglas Brady, Vice President of Product Management and Technology. 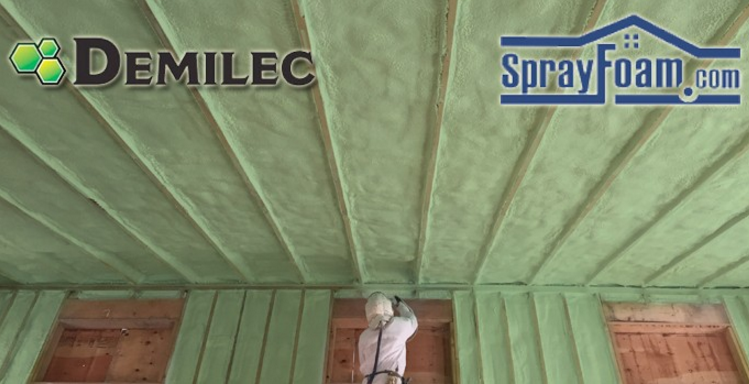 Demilec, Inc., a subsidiary of Huntsman Corp., has been recognized as an industry leader in using innovative technology and advanced science to create a line of open-cell and closed-cell spray foam insulation and coatings for more than 33 years. Demilec focuses on meeting market demands for more energy-efficient products and serves a range of industries, including industrial, residential, commercial, agricultural, original equipment manufacturer, education, water, oil and gas, energy, military, and civil. For more information, visit www.demilec.com. Certain information in this release constitutes forward-looking statements within the meaning of Section 27A of the Securities Act of 1933 and Section 21E of the Securities Exchange Act of 1934. These statements are based on management’s current beliefs and expectations. The forward-looking statements in this release are subject to uncertainty and changes in circumstances and involve risks and uncertainties that may affect the company’s operations, markets, products, services, prices and other factors as discussed under the caption “Risk Factors” in the Huntsman companies’ filings with the U.S. Securities and Exchange Commission. Significant risks and uncertainties may relate to, but are not limited to, volatile global economic conditions, cyclical and volatile product markets, disruptions in production at manufacturing facilities, reorganization or restructuring of Huntsman’s operations, including any delay of, or other negative developments affecting the ability to implement cost reductions and manufacturing optimization improvements in Huntsman businesses and realize anticipated cost savings, and other financial, economic, competitive, environmental, political, legal, regulatory and technological factors. The company assumes no obligation to provide revisions to any forward-looking statements should circumstances change, except as otherwise required by applicable laws. Demilec warrants only that its products meet the specifications stated herein, if any. Typical properties, where stated, are to be considered as representative of current production and should not be treated as specifications. While all the information presented in this document is believed to be reliable and to represent the best available data on these products, DEMILEC MAKES NO WARRANTY OR GUARANTEE OF ANY KIND, EXPRESS OR IMPLIED, INCLUDING BUT NOT LIMITED TO ANY WARRANTY OF MERCHANTABILITY OR FITNESS FOR A PARTICULAR PURPOSE, NON-INFRINGEMENT OF ANY INTELLECTUAL PROPERTY RIGHT OF ANY THIRD PARTY, OR WARRANTIES AS TO QUALITY OR CORRESPONDENCE WITH PRIOR DESCRIPTION OR SAMPLE, AND ANY USER OF PRODUCTS DESCRIBED HEREIN SHOULD CONDUCT A SUFFICIENT INVESTIGATION TO ESTABLISH THE SUITABILITY OF ANY PRODUCT FOR ITS INTENDED USE AND ASSUMES ALL RISK AND LIABILITY WHATSOEVER RESULTING FROM THE USE OF SUCH PRODUCT, WHETHER USED SINGLY OR IN COMBINATION WITH OTHER SUBSTANCES. Product(s) described in this publication may be hazardous and/or toxic and require special precautions in handling. For all product(s) described herein, the user should obtain from Demilec detailed information on hazards and/or toxicity, together with proper shipping, handling, and storage procedures, and should comply with all applicable safety and environmental standards. The behavior, hazards and/or toxicity of the product(s) referred to in this publication in manufacturing processes and their suitability in any given end-use environment are dependent upon various conditions such as chemical compatibility, temperature, and other variables, which may not be known to Demilec. It is the sole responsibility of the user of such product(s) to evaluate the manufacturing circumstances and the final product(s) under actual end-use requirements and to adequately advise and warn future purchasers and users thereof.